Artist Susan Hudes' medium was water colour for Hudes Tarot with a mediaeval ambience. This feeling is augmented by costume and the use of other symbols of the middle ages, including the parchment maps which appear as a backdrop in some of the major arcana cards. 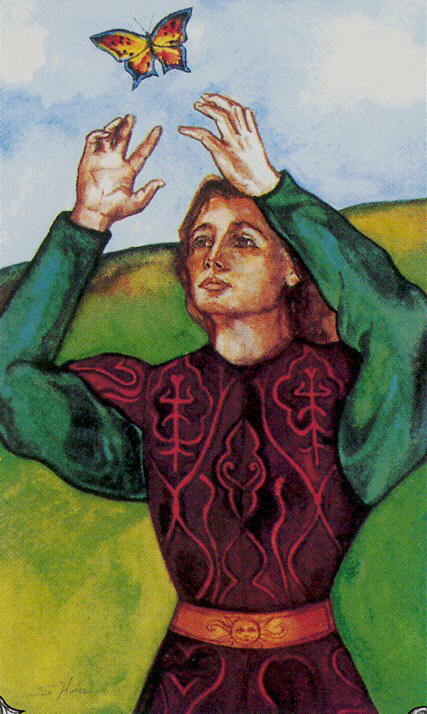 The Fool faces the reader, with his green-garbed arms reaching out towards a butterfly that is fluttering overhead. Of special note here is the detail that has gone into the symbols on his shirt and belt. If you don't want to pay attention to them, you don't have to. They are not screaming to be recognized. If you do decide to scrutinize them you will learn a lot about this Fool. With the Aces, Hudes uses flowers as a motif to illustrate the theme of each suit. The nature and number of flowers is significant. In the Ace of Cups two simple white flowers with two young tendrils indicate that this is process suit. The Ace of Wands shows four eight petalled golden flowers, the Ace of Pentacles shows nine lush purple blooms and the Ace of Swords depicts four blood red roses.